Since the province of Salzburg occupies a decent portion of the Alps and some of the hills north of them, the climate is too rough to allow wine culture. Historically, there were vineyards in Salzburg, but even the Prince Archbishops had their private ones somewhere in warmer regions for wine supply. That much about the bad news. The good news is that due to Salzburg′s close historic and geographic relationship with Bavaria, it can be considered to be part of the "Beer Belt" around Germany′s south. The great tradition of brewing can be seen in the sheer number of breweries and inns in Salzburg and surroundings. This, of course, was even more pronounced before 1950; after World War II, many local breweries closed down or were merged with bigger companies. However, there are still a number of good beers around Salzburg. 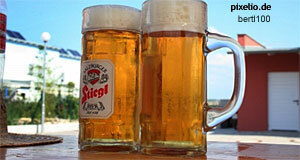 "Stiegl" is the oldest, which opens its "Brauwelt" brewery to visitors. There′s the Müllner Bräu with its famous "Märzen" lager beer and the brewery of Kaltenhausen near Hallein, known for its sweet "Bernstein" beer. A beer speciality of lent times (advent, the weeks before Christmas, and the weeks before Easter), when many breweries sell "Bockbier", a very strong beer with about 10 percent alcohol that was once designed to nourish fasting monks and keep them happy. If you want to try other beers off the beaten track, have a "Dunkles Hefeweizen", a dark white beer. It is sold in most inns in Austria. Beers go generally well with the rather heavy cuisine of Salzburg. Keep in mind that the harsh climate and the rural character of Salzburg limited sophisticated food to the higher classes in the city of Salzburg, peasants had mostly simple food too heavy for many light wines. In the summer, white spritzer is the only real competitor for beer, but in Austrian style: "Weißer Spritzer" consists of one part white wine (normally Austria′s all time favourite Veltliner) and one part carbonised water. The "Sommerspritzer" is a variation of that, consisting of 1/8 litre of white wine that is topped up to half a litre with carbonised water, which preserves the flavour of the wine without being too strongly alcoholic. On a general note: Austria is actually a very good place for wines, though mostly in the eastern and southern provinces of Lower Austria, the Burgenland and Styria. If you are interested in Austrian wines, as waiters for advice or try to arrange a "Degustation", a wine tasting, in a specialised wine store. There is one in the Steingasse. Milk is not necessarily a drink in the strict sense of the word, but liquid and certainly an important aspect of Salzburg culture. Especially farmers in the northern district "Flachgau" produce milk and there are multinational cheese and diary companies that originated from Salzburg, such as "Woerle" in Henndorf. Milk is celebrated in the "Salzburger Milchnacht", the "Salzburg Night of the Milk". Free samples of diary products are distributed in the Mirabell Gardens, normally by sampling people in Baroque-inspired costumes and dancers. There is music and milk and the ultimate proof that advertising can be pleasant. When the Austrian businessman Dietrich Mateschitz had an energy drink in the early 1980ies whilst being on a business trip in Southeast Asia, he got the idea to commercialise energy drinks in the new European market. This idea led to a rather recent addition to Salzburg′s drink repertoire: Red Bull. The energy drink company has its headquarter in Fuschl, the Red Bull aeroplane collection is presented to the public in the recently opened Hangar-7 and mastermind Dietrich Mateschitz lives in a house on the Nonnberg in Salzburg. Red Bull is a very sweet soft drink that contains taurine, an amino acid, and caffeine. It′s not really drinkable with any sort of food, but very popular with young people and others who want to stay up all night and party. Despite of Red Bull being a multinational company these days, the energy drink is genuinely Salzburgian and therefore, you should have at least one can whilst you are in Salzburg.